Your first 'proper' job was probably a challenge, but I doubt you had the added awkwardness of working for the agency that represented one of the most famous writers in the world, and one of the most reclusive. Joanna Rakoff did, and in My Salinger Year she tells the story of her year working at one of New York's oldest literary agencies, which happened to represent J. D. Salinger. To say that this is a book about Salinger, though, would be an exaggeration. The author plays a tiny role in My Salinger Year, which is more about growing up than it is about the guy behind Catcher in the Rye. Set firmly in the world of publishing, My Salinger Year is a great insight into the way things used to be done, and into the way some facets of publishing took ages to catch on to digital. One particular favourite moment of mine is when Rakoff describes how her boss acknowledges she doesn't know what an electronic book is (this is 1996), but she's still not signing away the rights for it. That, plus the agency's pink card filing system, the introduction of one computer, and the pedal-driven dictaphone Rakoff uses, among other things, all made me smile, shake my head in disbelief and then smile again. One thing that didn't make me smile, though, was when the agency lost Judy Blume as a client, which I can only put down to its reluctance to try new things, and should be a lesson for everyone. Since the book is called My Salinger Year, I guess I should address the issue of the author himself, who comes across as a nice but slightly-deaf man who doesn't enjoy fame one bit. Rakoff's reading of Salinger's fanmail is full of emotion - I can't help but think of all those people who wrote to Salinger and never got replies, because most of them seemed to pour their hearts out on paper to a man they thought would understand them. 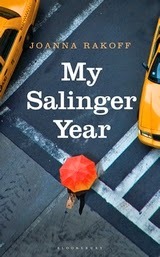 My Salinger Year wonderfully illustrates the power of authors to connect with individuals, even as they write for masses. We're never told the name of the agency Rakoff is working at, or the name of her boss, which I found unnecessary all of the time and jarring most of the time. It's unnecessary because a quick search online will lead you to discover the agency is Harold Ober Associates and Rakoff's boss is Phyllis Westberg. I resisted until two thirds of the way through before I decided to go online, but it was tough. And it's jarring, because by never naming them, Rakoff is always substituting "my boss" or "the agency" for real names. One moment where it particularly doesn't work is after the death of someone very close to Rakoff's boss, which leads Rakoff to ask a colleague: "Is my boss okay?" In a situation like that, you'd never use a person's title, and it really grates. But that's a small gripe, because My Salinger Year usually flows so well that you think you're reading fiction. However, any encounters with Don, Rakoff's then-boyfriend, make you realise this is real life. There is no way any writer could have created a boyfriend as lazy and self-absorbed as Don, and a protagonist who just didn't see any of his faults right until the very end. But Rakoff's relationship with Don is also one of the most compelling parts of My Salinger Year, since it gets right to the heart of the growing up that Rakoff is doing during her year at the agency, which also includes negotiating old friendships and relationships. My Salinger Year is part The Devil Wears Prada, part New Girl, and better than those two because it's real. Compulsively readable, My Salinger Year will take you racing through the New York publishing scene in 1996, and then have you reaching for your copy of Catcher in the Rye. How I got this book: Borrowed from a friend.